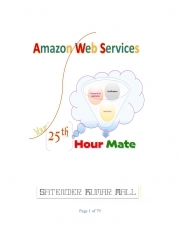 Description of "Amazon Web Services - Your 25th Hour Mate (eBook)"
Amazon Web Service - Your 25th Hour Mate book focuses on AWS concepts at glance. It is useful book for your journey toward understanding Amazon Web services, certification, interviews and troubleshoot in nutshell. This book provides pictorial representation about the available services and its implementation. It is concise and to the point book instead of heavy explanation based. 101 Refresher dose, would help you quickly memorise and refresh the AWS services in final hour of your need. Reviews of "Amazon Web Services - Your 25th Hour Mate (eBook)"
As the name suggests, it's for those people who have a little idea about AWS. This is a crucial guide for you if you're thinking to move your web applications to the cloud. It starts with the introduction of the services provided by the AWS. It'll show how to use AWS toolsets in your projects that relieves you from the burden of maintaining expensive hardware.The Author has gone into great detail in explaining some of the very hard topics fairly easily. Highly recommended.